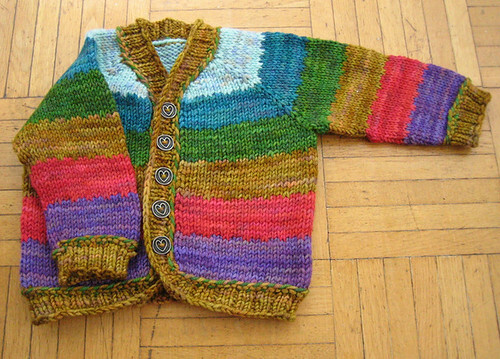 I just recently knocked out this adorable little baby cardi as a shop sample for Urban Yarns. I had seen Rocketry and Tulip on blogs and always wanted to knit one, and the yarn was also tempting, so all in all this was a very fun and satisfying knit. Baby things are sooooo quick and easy! I followed the pattern exactly, and I didn’t make any modifications. The shop is selling these as kits, so I had to knit one to test that there would be enough yarn included. The pattern is a seamless top-down knit, which is shaped by increases along raglan ‘seam’ lines. This makes it a VERY easy, no-fuss knit. In the end, there is absolutely no seaming to be done, just several ends to be woven in. 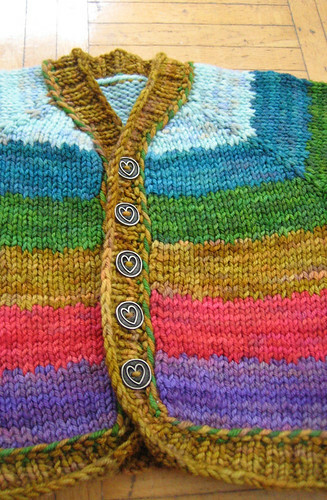 I think the little heart buttons are an adorable finishing touch! I would be VERY happy to knit with this yarn again in the future – it has such wonderfully subtle shifts in colour, and knits up into a very plump, satisfyingly squishy fabric. I can’t wait until I have friends with babies to knit for!